Weighty Matters: Hamilton Wentworth School Board's "Food Drive for Student Nutrition" Culminates in Pizza Party? Hamilton Wentworth School Board's "Food Drive for Student Nutrition" Culminates in Pizza Party? Full disclosure. I adore pizza. I mean really adore it. So much so that when my kids asked me the other day what food I would pick if I could only eat one food for the rest of my life I unhesitatingly answered, "Pizza". That said, I don't order Pizza very often. But you know who loves pizzas even more than me? Schools. But they don't have many qualms about how often, or even simply how, they use them. 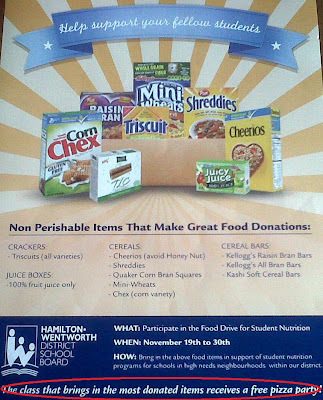 Up above's a photo of the Hamilton Wentworth District School Board's incentive to participate in their "Food Drive for Student Nutrition". The reward? A pizza party for the class that brings in the most donations. Honestly is there any fast food product more firmly entrenched in schools than pizza? Check out these fundraising photos both sent/taken just in the past week. The first is from Domino's, the second from Boston Pizza. While I feel for the schools, raising money by selling products that children should be eating less of, not more, and using junk food to reward good behaviour, is contrary to the school system's primary job of building healthy children. Furthermore, it undermines parents who try to keep these sorts of foods at a dull roar in their children's lives. What else could schools do? Fresh produce drives. Garden kits. Crafts. Garage sales. Community cleaning runs. Grandparents' days. There are in fact many ways to raise money without resorting to the easy way out of increasing fast food consumption among the student and parental bodies. Pizza and schools should not be married. Would love to see someone start some divorce proceedings.